Radio Active #8 is dedicated entirely to the music of the Atomic Swindlers, a Ziggy Stardust-meets-The Fifth Element rock’n’roll band. The podcast features a review of the band’s album Coming Out Electric as well as two tracks from the CD. 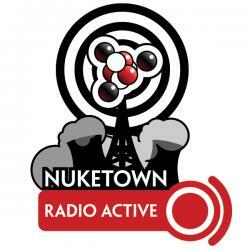 There’s also the first-ever Radio Active podcast, in which Nuketown’s readers and listeners in the continental U.S. can enter to win a Swindlers CD and t-shirt. For details, listen to the podcast, or check out the show notes below. Important Note: Although the podcast says otherwise, I’ve extended the contest so that it now runs until Monday, July 11; with everything being mailed Tuesday, July 12, 2005. I encountered far more technical problems editing this show together than I expected, and I want to make sure everyone has a chance to enter the contest if they want to. Dave Slusher of Evil Genius Chronicles makes it look easy folks. And it’s not. No book review this time — I want to dedicate the remainder of the podcast to a review of “Coming out Electric” by the Atomic Swindlers. I should note that the Swindlers are advertising on Nuketown this month, but that’s not the reason I’m reviewing them here: the reason why is, well, they’re pretty damn good. The Swindlers are a rock band that brings to mind David Bowie at his Ziggy Stardust finest, with heavy doses of The Fifth Element’s irreverence and explosive fun thrown in. First heard about them when their agent contacted me about the band. What got me hooked though, was their video for “Float (My Electric Star Girl”, the first track on Coming Out Electric. The sound was great — sensual and laid back, the sort of thing you could just sit back and lose yourself i. The video though, made it even better. Done in a “Samurai Jack” sort of style, it tells the story of a intergalactic lesbian space biker chick out to rescue her imprisoned girlfriend. Sound campy? Hell yeah … but good campy. I mean, hell, the Silver Surfer? When has that ever made it into a song? Ever? Don’t take my word for it though — listen for yourself. The Swindlers have given me permission to play this song on the podcast. This is not a Creative Commons song and I had to secure permission from them to play it. Not all of the tracks on the CD are like “Float”; in fact, most aren’t. There are a few other slow songs, but none of the others have that “Dark Side of the Moon”/Pink Floydish kind of Quality. “Space Bandit” is a good example of the other tracks on the album — I like its fast-based, driving sound, particularly the guitar solo, but I also love the lyrics. It may take two or three listens (or a visit to their site to pick up on all of the) but if you’re like me, as you listen to the lyrics you’ll get this big, dumbass smile on your face as you realize just how deep into scifi geekdom these songs venture. To me, listening to this CD was like the first time I saw The Tick TV series: I though: here are people who get it. So what’s the downside? Not all the tracks are as well produced as “Float”, and there are some rough edges that could have been sanded off with enough time and presumably money. But then again, those rough edges also make the sound endearing. This is obviously a labor of love … and doesn’t that describe most of science fiction? It’s tough only picking two tracks to play on the podcast, because all the tracks are so different, and each has its own merits. In my Nuketown review I gave the CD a 8/10, but its really more of a 8.5 out of 10 (my review system doesn’t do fractions). You can learn more about the band by visiting their web site at www.atomicswindlers.com. The link will be in the show notes, as will a link to CD Baby, where you can buy the CD if you like. If you do buy a CD, please tell ’em Nuketown sent you. Check out Radio Active #8 and note which Atomic Swindlers songs we played. Send an e-mail to nuketown@gmail.com with the names of the songs, your postal address, and an e-mail where you can be reached. When I receive your e-mail, you’ll be entered to win the Atomic Swindlers’ first CD, “Coming Out Electric” as well as an Atomic Swindlers T-Shirt. If you send an audio comment with your e-mail, you’ll receive two entries in the contest. Four winners will be selected, and the contest will end Monday, July 11; everything will be mailed Tuesday, July 12, 2005. Restrictions: In order to prevent me from going broke mailing out the prizes, this contest is restricted to the continental U.S. Contacting Nuketown: You can send comments to the show via e-mail at nuketown@gmail.com or Skype me; my user name is “nuketown”. Next time on Radio Active: a review of Orson Scott Card’s novel Ender’s Shadow, which is a retelling of the classic sf novel Ender’s Game from the perspective of Bean, another student who attends Battle School with Ender.